Graphing Athletics: The story of the javelin – a Viking dominated event? Following on from the insights we found in the in the 100 metres datasheets we moved our attention another athletic event, the javelin. The javelin is perhaps the closest modern sporting event linked to ancient human warfare and a full explanation and history of the event can be found here in our blog article. So what are the key events which have taken place in the javelin event over the past century? Do they follow a similar pattern to the 100 metres? For more information on the format of the datasheets and how to interpret the information, please see our original article on the 100 metres. Click on the images below to visit our datasheets. As we saw with the 100 metres, the early years of the javelin were dominated by European countries, in particular the Scandinavian countries of Sweden, Finland and Norway. Again this could be down to socio-economic reasons. However, unlike the 100 metres event the dominant nations in the early years of the javelin still appear to be prevalent to this day, in particular Finland. Similar to the 100 metres countries have come in to the sport and put themselves as world leaders. In particular the Eastern European countries of Poland and Latvia have established themselves in the top 25 list in the last three decades. The USA appear as a dominant country in the middle of the last century, but this dominance has dwindled in the past 30 years or so. There are many potential reasons for why the javelin is still dominated by European countries, and again these are difficult to pick apart, but can be broken down in to two categories, either culture/environmental or genetic. A javelin culture does exist in these European countries and the legacy of past performers cannot be underestimated. In Finland there is even an annual week long carnival in the town of Pihtipudas to celebrate the event and inspire the next generation of throwers. Just like the dominance of Jamaican sprinters, Scandinavian javelin throwers could benefit from a genetic effect and a physiological advantage. Could the Viking ancestors of these Scandinavian countries have passed on specific genetic traits which suit the javelin event? Does this mean Vikings make the best javelin throwers? Check out the map below which shows Viking influence across Europe. From another perspective the dominance of Europeans countries could be down to the low uptake of other countries taking up Javelin, perhaps because the dominance of European countries is not worth a challenge? Perhaps a lack of cultural history or expertise. This may mean the global competing population within the javelin could still be relative small and still concentrated in Europe. In London 2012 Trinidad and Tobago Keshorn Walcott caused a sensation at the London 2012 Olympic Games when he became the first man from outside Europe to win an Olympic medal since 1972. In the women’s javelin event there is a similar pattern, with the early years of the event dominated by Germany. The Soviet Union and East Germany appear as a dominant force in the middle of the 20th century. In the women’s event China and Cuba appear as dominant countries from the about the 1980s onwards. It appears that when you get to the top in Javelin, you can stay there. In the early years of the men’s event Eric Lemming from Sweden appears in the top 3 year best performances for an astonishing 16 years, this was nearly half his life! From the 1930s onward Finnish thrower Matti Henrikki Järvinen was in the top 3 for 13 years and Janusz Sidło from Poland was in the top 3 for 9 years from the 1950s. In more recent times Jan Zelezny was in the top 3 for 12 years, and achieved 3 gold medals and one silver at the Olympic Games! In comparison Carl Lewis was in the top 3 of the 100 metres for a mere 8 years showing that if you want a long athletics career you need to throw the javelin. For the women’s event Trine Hattestad from Norway appears the greatest number of years in the top 3, at 8 years, breaking the world record twice in her career. 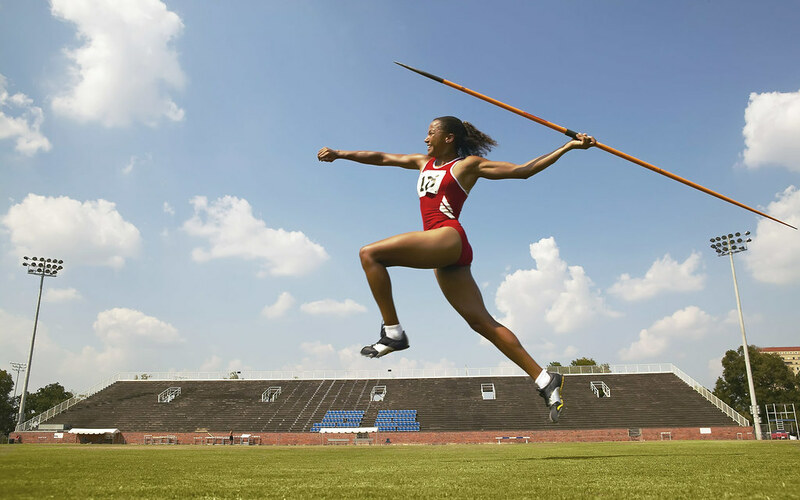 In the early 1950s the javelin throwing event saw a technological change concerning the construction of the javelin. To increase the distance of a throw the surface area of the javelin was increased, allowing more for lift during the flight phase and thus increasing distance. To keep the new javelin mass constant and in line with the rules, the construction of the javelin changed and designers made the javelin hollow. A new technique was used around this time, however this technique was short lived and banned in 1956 due to the risk to spectators. The Spanish Javelin technique employed a full rotation before releasing the javelin, similar to the discus technique. This meant it was dangerous as the javelin could be released in any direction and potentially into crowds of viewing spectators! Any influence on javelin performance was brief and it is believed that any visual effect on performance cannot be seen. The video below illustrates well the potential damage that could result from the technique. As javelin performances evolved, the greatest measured distance in the javelin event reached 104.80 m in 1984 with a performance from Uwe Hohn. This throw distance was potentially dangerous for spectators and athletes within the athletic stadium and required change to improve safety. As athletic stadiums could not be increased in size, the obvious answer was to change the specification of the Javelin. The IAAF acted in changing the rules concerning the specification of the men’s 800 gram javelin with the new rules coming in to force on the 1st of April 1986. The centre of gravity of the javelin was shifted 40 mm forwards, moving it away from the centre of pressure and leading to an increased downwards pitching moment during the flight phase. The rules were initially brought about due to disputes arising from the difficulties in judging the fairness of flat javelin landings, but had the added benefit of increasing safety by reducing javelin performance (IAAF). A similar rule change was implemented in the women’s event in 1999, with the centre of gravity being move 30 mm forwards. A drop in performance is can be seen in the men’s javelin event in 1986 and similarly in the women’s javelin event in 1999. To counteract the drop in performances due to the centre of gravity rule change in the men’s javelin event the aerodynamics of the javelin was altered by designers to increase the throw distance once again. The tails of javelins in both the men’s and women’s events were made rougher to decrease the pressure drag in the hope to increase flight distances of the javelin. These changes were short lived and banned by the IAAF at the end of 1991 (IAAF) and throws set with this modification were omitted from the record books. For the next installment of graphing athletics, we will be looking at another field event – the shot put.